Creating a Japanese garden in your home gives you a space that is both serene and peaceful. They are world-renowned for their grace, beauty, and style. Many visitors to Japan bring home souvenirs – posters, paintings, artwork – depicting their exquisite settings. The Japanese word for garden, “niwa”, has its origins as “ritual space”. They are created to be used as places of contemplation, meditation, and reflection, and as imitations of the natural world. 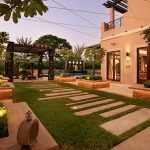 This simplistic goal leads to gardens with a flair for style and distinction, but not a lot of flash. They encourage one to relax, turn inward, forget the cares of the world, and settle into a more uncomplicated mood.While you may not hold to Zen Buddhist philosophies of enlightenment and introspection, their peaceful recreation of the natural world is something you CAN create in your own backyard, bringing a bit of the Orient to the desert. Japanese gardens have, at their heart, an air of simplicity and minimalism. From the rocks or sand of a Zen garden, to a rather monochromatic color palette, to the uncomplicated sound of a single water feature, Japanese gardens aren’t known for their flash and flair. A Japanese garden, rather, finds its beauty in its careful, sophisticated design. Most only feature a few plants, carefully placed. Nearly all have only a single visual focal point – a tree, a statue, a pond. The colors are vibrant but few, splashes of blossoms against dark leaves, or white rock against green turf. 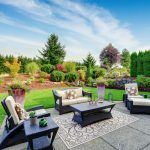 Negative space – the pebbles in a rock garden, or a lush ground cover – is as important as the features that draw the eye.This simplified, uncomplicated style makes recreating a Japanese garden easier than say, a lush French-inspired landscape. But it also means you must be very careful not to go too far and lose the “look”. The best-known version of a Japanese garden is the rock garden. Traditionally, these are used for contemplative, meditative exercises like raking and rock stacking. The monk or gardener would find inner peace while raking designs in the sand or pebbles, or in stacking one rock upon another. You don’t need a journey for inner enlightenment and a daily meditation practice to have a rock garden now. You can create one for the joy of its simple beauty. It’s also an excellent option for areas that may already have “hard to grow” sandy soil. 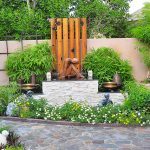 You can choose whether or not to have it as a feature in your Japanese garden, or as just a nice addition off in a corner. It can even become a real conversation piece, especially if you periodically DO rake a new design in it. Another form of Japanese garden that is quite popular is the Strolling Garden. Here, a pathway winds through the garden, pausing at various focal points – statues, plantings, benches, a pond. This is easily recreated with a pebble or “negative space” walkway and carefully placed accessories and plants. You can even screen parts of the garden from others with pots of bamboo (yes, some WILL flourish here) or wooden wall portions. Most traditional Japanese plants, sadly, don’t do well in the dry, hot climate of Dubai. However, there are a few that can successfully be grown here. Golden Goddess bamboo ( Bambusa Vulgaris) will add just the right Asian touch to your pond or pathway. Buddha Belly Bamboo (Bambusa Ventricosa) is a dwarf bamboo that grows beautifully in this climate. Japanese maples will also do well, if you keep them out of the wind and water them properly. Many “bonsai” tree varieties, such as Ficus, Desert Rose, Juniper and Cedar, can also be grown in their miniature containers, adding a truly authentic Oriental feature to your Japanese garden. Some desert climate plants, like those in the ajuga family, have the right style and visual appeal for a Japanese inspired garden. Our landscape experts here at Milestone can assist you in choosing just the right plants and trees for yours. Don’t forget that Japanese gardens are also to be used and enjoyed. That includes accessories such as simple wooden or stone benches and tables, lanterns and fire pits, and statuary. Your strolling garden, after all, has to have focal points to encourage you to stop strolling, relax, and enjoy those features along its path. If you have a yen for a Japanese garden in your life, as we’ve seen, it’s not an impossibility here in the UAE. And it will certainly set your garden apart, as few would think to find such a hallmark of Asia here in the Middle East. 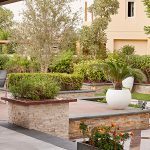 However, there is a lot to consider, from garden style to layout to accessories and features, and a lot of work to transform the typical Dubai garden into an Asian paradise. That’s where Milestone can help. Contact us today and we can begin the planning creating a Japanese garden of your own. Bring home more than souvenirs!